Ms. Maria couldn’t believe how quickly the salad was eaten– the kids love kale! 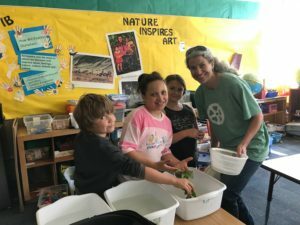 Carl Cozier’s food service lead Maria Moench made sure that the kale, harvested from the Cozier school garden by Mrs. Conlon’s second graders, became part of a tasty Plant Part Salad. By the start of the second lunch period, the salad had been completely devoured by Promise-K and Kindergartners! 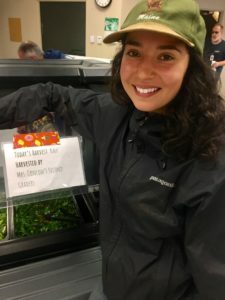 Maria now faces a challenge: making sure there is enough garden-fresh produce available for all lunches – especially for the kids who planted or harvested the produce! 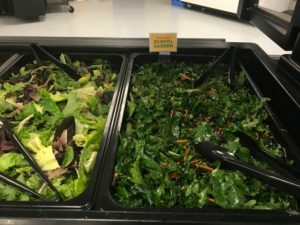 Such garden harvests and tastings at Carl Cozier have become possible as a result of a recent garden revitalization and expansion. 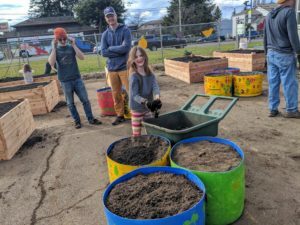 No longer limited by a small growing space, Cozier kids now have more opportunities to be adventurous eaters and try more fruit and vegetables! “It’s great we get different foods into the cafeteria!” exclaimed Hazel, a 1st grader at Carl Cozier Elementary. Hazel’s enthusiasm is shared by fellow students. Common Threads AmeriCorps Food Educator at the school, Gabby Mednick, remarks how frequently at recess kids enter their newly refurbished garden to check out what’s growing and taste test something new and fresh. “It’s rewarding seeing so many kids get so excited about gardening and eating vegetables,” commented Gabby. 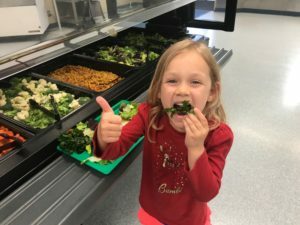 Thanks to the new Bellingham Public School District Garden to Cafeteria toolkit, the Carl Cozier community is part of a growing body of schools harvesting greens to be served in the lunchroom. As a Common Threads supporter, you’re making this happen: THANK YOU! Plant part salad ~ student-grown, harvested and devoured!